Man, did “simian.interface++” make me smile a lot. It’s a little puzzle game from the indie studio vested interest (yes, it’s styled like that), it was on sale for a mere $1.50 when I got it, and it offers so much bang for the buck. Let’s call it “Simian” for sanity’s sake. You seem to be playing the part of a monkey in some type of lab, with your brain hooked to a computer. There’s a pixelated interface that has you logging into various challenges in which the goal is, to oversimplify a bit — this is such a visual game it’s hard to fully describe what’s going on a lot of the time — to get shapes to line up with one another. 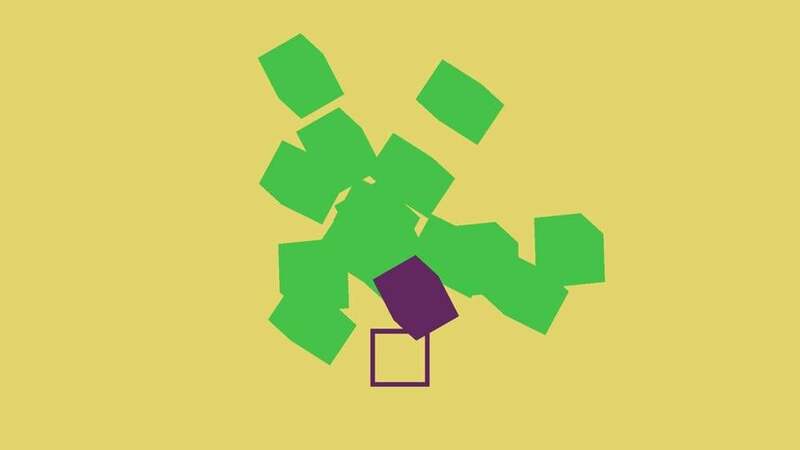 To take a simple example, in some early levels, you use your mouse to move a little box into a square. Things quickly get a lot more interesting and complex: Sometimes you’re controlling dozens of shapes at once, watching kaleidoscopic imagery unfold when you move the mouse. The game doesn’t tell you what the objective is on any given level. Oftentimes it’s to get those shapes to line up, but sometimes it’s to arrange things so they form a pattern. This is a game with a lot of “Eureka!” moments; there’s frequently a sense of things clicking into place, Rubik’s-Cube-like. There’s some very subtle, very effective game design going on here. Often I would move the mouse around almost at random, and find myself intuiting what the game was looking for without fully understanding how I had figured it out, which is a sign of really good design on the part of vested interest. Even exceptionally complex-seeming visual arrangements — wild constellations of squares, rods, and other shapes — would suddenly make sense with enough playing around. By the end of the game, things had gotten really wacky and visually creative; everything evolved, in a satisfying way, from the simple task of trying to get a box into a square. There were a lot of nice little touches in addition to the core gameplay. The music, by a Brooklyn-based chiptunes composer who goes by Note!, was really energizing and, solid (I preferred the chiller songs, which I could see myself listening to when I’m doing other stuff, to the more intense ones), and there were all sorts of little visual jokes throughout, from the virtual bananas you get as rewards to cute kittens — everyone knows monkeys love kittens — that kept showing up. “Simian” is a short trip, though; it probably took me under an hour to get through the game. There’s also an infinite mode in which you try to best your top score, but the primary draw here is the core gameplay. I’d love to see enough people buy it so vested interest can make a bigger version. A game this clever and stylish deserves to be longer and more fully fleshed out, though given the price, this is a great bargain, and the sort of game that feels like it could attract a lot of folks who might not otherwise play games.